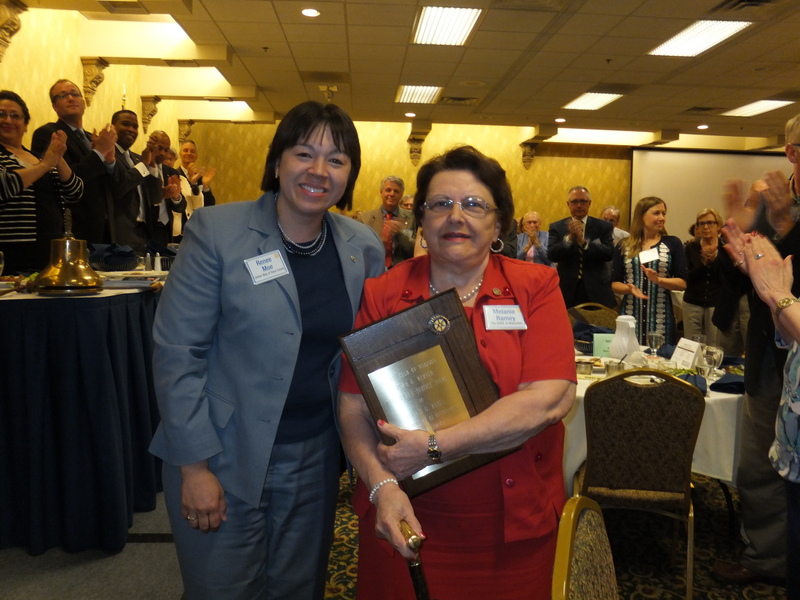 The 2014 Joseph G. Werner Meritorious Service Award is presented to Melanie Ramey for her extensive service to Rotary. Joining the club in 1991, Melanie immediately signed on for committees, especially those that called for a tireless volunteer. She brought humor and hard work to every task and seemed always ready for the next assignment. She became a Rotary News reporter, managed the Sergeant at Arms position and was elected to the board of directors, then vice-president, president in 1998-99, followed by more service on the board of the Madison Rotary Foundation. Her Rotary reach extended to leading the Ethics Symposium Committee and helping organize the first Ethics Symposium for high school students. She is a mentor for Rotary scholars, an advocate for UW and Edgewood College students in Rotaract, helped secure funding from Rotary International Foundation to launch CECADE, the club’s signature international project, is active on the Orientation, Visitor Hospitality, Member Development Committees, and on and on. There is also something special about Melanie and money. There was a club auction held in 1994 to raise funds for community grants and youth awards. President Alan Orenberg used words such as brash, forceful, persuasive to describe her auctioneering style, but he also praised Melanie for the $8000 added to the fund. In 1998 at the start of her term as president, she inaugurated the system to pay forward on your birthday with the suggestion that each celebrant make a gift of one dollar for each year of age, rounded up to 100. Succeeding presidents have not wanted to tamper with a sound money scheme and to date Melanie’s presidential year idea has averaged over $26,000 a year for a 15-year total of $402,021 to the Foundation from the birthday “tax”. The Werner Award Committee also takes into consideration an individual’s work for community causes whether as a volunteer or professional. In 2010, Melanie was nominated by our club and was selected by the Madison Area Service Club Council to receive the Ruth Gordon Service Award. This award is given to honor an individual who, over time, has exemplified the concept of volunteer service for the betterment of the community. In 2012, the club honored Melanie with the Manfred Swarsensky Humanitarian Service Award and detailed many of her selfless acts in support of others. Individuals and organizations needing an advocate seem to find Melanie or perhaps she finds them. Those living in poverty, those in prison or any who are denied rights as citizens have seen that same forceful, persuasive, might I add, brash and effective style, put to work on their behalf. In November 1974, nearly 40 years ago, club president Ted Long presented the first Werner award. He told the club that the intention is not to provide a reward or incentive for Club efforts, but rather to maintain examples of the Rotary tradition of “Service above Self”. It was a special moment for Ted. Joe Werner had been his mentor at the law firm and his sponsor for Rotary membership. It is also a special moment for me to congratulate a friend who becomes the 29th member of this club to receive the Joseph Werner award. Melanie Ramey. History of Joseph G. Werner Meritorious Service Award: In 1974, our club established the Joseph G. Werner Meritorious Service award as the club’s highest recognition for club service. This award is granted by our Rotary Club in recognition of outstanding club service in the Rotary tradition of “Service Above Self.” Joseph Werner was a committed Rotarian. He chaired many significant committees, both before and after serving as club president in 1953-54. He served as a district governor in 1958-59 and became the second member of this club to serve as director of Rotary International in 1969-71. He later served Rotary International in many other positions, and two different RI Directors indicated that Joe was in line for president of Rotary International at the time of his death from cancer in 1973. Joe was a truly committed Rotarian whose example of “Service Above Self” is memorialized in this award. This entry was posted in 2. Meetings, 5. Members, History, Joseph G. Werner, Joseph G. Werner Meritorious Service Award, Rotary Club of Madison and tagged Club Service Award, Community Service Award, Joseph G. Werner Meritorious Service Award, Rotary, Rotary Club of Madison, Service Above Self. Bookmark the permalink.